Special Containment Procedures: SCP-292 is to be kept at Site-72, in a guarded room in a locked, padded container set up to avoid movement of or damage to SCP-292. Access to SCP-292 is prohibited without Level-3 authorization. Site personnel must report all incidents of déjà vu or related symptoms to Site Administration. 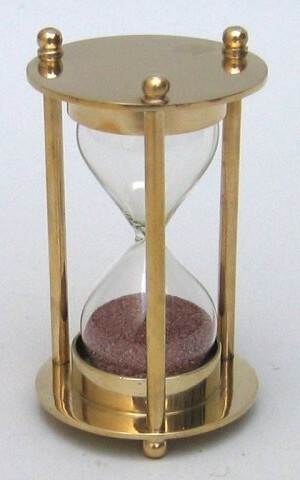 Description: SCP-292 is a sixty-second brass hourglass, 10 cm tall. When all its sand is at the bottom and SCP-292 is flipped over, only two outcomes have ever been observed: either the sand runs out normally after one minute, or SCP-292 is knocked over on its side. (If SCP-292 is knocked over, anomalous properties do not again manifest until all the sand in SCP-292 is in one bulb.) At no time has SCP-292 ever been observed to be flipped over a second time within sixty seconds, except when knocked over as above. Any time SCP-292 is upright and all its sand is in its bottom bulb, and a subject attempts to flip SCP-292 over with the intent to flip it again before all its sand runs out, the subject and people nearby suddenly experience déjà vu. The intensity of déjà vu is inversely proportional to a person’s distance from SCP-292; the subject is often momentarily stunned by the experience. Persons experiencing déjà vu from the same event often describe similar “recalled” experiences. It is believed that when SCP-292 is flipped over, a process is started in which, if SCP-292 is flipped again before its sands run out, time flows in reverse to a point a couple of seconds before SCP-292 was initially flipped.1 Time then flows forward again as if SCP-292 were never flipped; déjà vu would thus be a side effect of this process. Procedure: Subject 03101 was instructed to flip SCP-292 over, and then shoot Subject 03102 to death and flip SCP-292 back over before it runs out. Results: As Subject 01 reached for SCP-292, both subjects as well as other personnel in the area reported feeling déjà vu. Subject 01 exhibited elevated levels of adrenaline, while Subject 02 exhibited pronounced apprehension in the presence of Subject 01. Procedure: Subject 04601 was instructed to flip SCP-292 over, wait thirty seconds, and flip SCP-292 back over. When déjà vu was experienced, Subject 04602 was instructed to do the same thing. When déjà vu was experienced a second time, Subject 04603 was instructed to do the same thing. Results: As Subject 01 reached for SCP-292, all subjects experienced déjà vu as expected. Subject 02 hesitated and was instructed to flip SCP-292. While reaching for SCP-292, Subject 02 fell to his knees, Subject 01 doubled over, and Subject 03 staggered. Subject 03 was instructed to flip SCP-292, and as he reached for SCP-292, all subjects appeared to exhibit temporal shock3 for ten to fifteen seconds before falling unconscious. Temporal symptoms subsided within five to seven days, while visual and audial hallucinations persisted for several months more. While preparing for Experiment 292-75, Dr. █████████ suddenly clutched SCP-292 to his chest and reported he had just experienced déjà vu. Dr. █████████ said that he felt like he was about to drop SCP-292, and if he did, “something bad” would happen. Dr. ██████ has hypothesized that Dr. █████████ had indeed dropped SCP-292, but instead of breaking, SCP-292 reversed the flow of time until a moment before it was dropped. If SCP-292 does in fact possess such a self-preservation system, the potential consequences [DATA EXPUNGED]. Reclassification to Euclid approved ██/██/20██, until more information on SCP-292’s properties can be gathered and analyzed. 1. This effect is similar in nature to that of SCP-1876, albeit with different psychological effects on those experiencing the phenomenon. 2. More information can be found in Document 292/48K, "Theoretical and Observed Symptoms of Temporally-Related Afflictions".